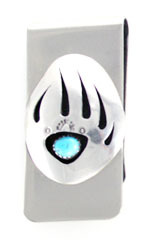 Navajo crafted sterling silver large badger paw with small free form turquoise stone set on nickel base money clip. Measures 2" long by 1" wide. Crafted by Ervin Begay.